Service Apartments in Gurgaon for Rent, Service Apartments on Rent. Treetop Greens offers you with service apartments in Gurgaon at affordable rents. 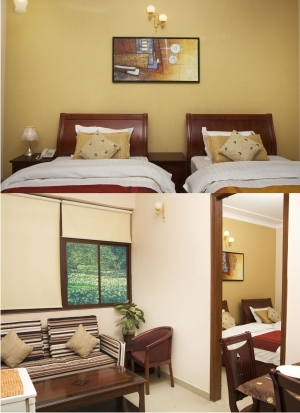 We present to you serviced apartments that are a perfect package of the holiday. It’s always exciting to live in new places for a short duration. It exposes us to new people, culture, weather, etc. Our service apartments in Gurgaon are ideal for medical guest, business guest or for any purpose that requires you to stay for a long or short time. As Gurgaon is a business hub housing every big brand, one can imagine, people come from other states of India and from abroad. They come here to meet their clients, business meetings and for personal reasons. Gurgaon has the best hospitals with the best doctors and technology for the treatment of every kind of disease and ailments. Medical tourism is on the rise in India, especially Gurgaon, for this very reason. Unfortunately, not everyone can afford a hotel to stay. You may require staying at a place where you feel like a home but do not have to pay like a guest in a hotel. Looking at the needs of people, we have come up with an affordable and comfortable solution for people. Everyone has the right to treatment, and high rents or hotel bills should not stop people from it. We have a full range of rooms to rent out to people who come here for their treatment. You do not have to worry about the hassle of booking room. You can book a room well in advance over the phone. Our rooms come with a kitchen and kitchen utilities like an in-room hotplate, crockery, etc. You are free to cook and eat as per your choice and diet. In case, you do not want to cook we can arrange a cook. Isn’t that wonderful? It’s entirely different from hotels and lodges where you are not given such option. The malls, metro station, hospitals and bazaar are at a five-minute driving distance. You can hang out at malls and shop to your heart’s content. If you’d like to visit New Delhi for shopping or business purpose and do not want to get stuck in the endless traffic, you can use the metro station. Our service apartments in Gurgaon are, therefore, the perfect place to stay and fulfil your personal and business obligations. Our motto is customer satisfaction, and we go to any length to fulfil it. Living at our serviced apartments will prove our motto to you. We are sure you’ll provide us with an opportunity to serve you and your dear ones while living at one of our service apartments in Gurgaon. We welcome feedbacks from our customers. Feedbacks are like lessons to us through which we learn and ensure to avoid such situations in the future. Do not hesitate to leave feedback that will help us to improve our service and offer better and accelerated service to others and you when you revisit us. 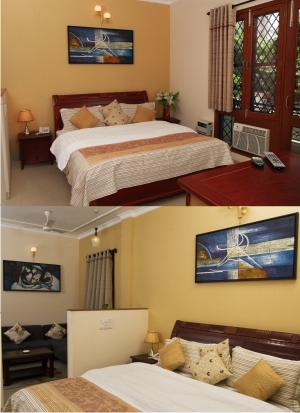 "From every perspective, our service apartments in Gurgaon are ideal for all the needs that bring you to this city. "